Leaky Gut: The Cause of Your Health Problems? Home/Blog, Uncategorized/Leaky Gut: The Cause of Your Health Problems? Many health practitioners believe that ‘leaky gut syndrome’ is a possible starting point or connection with many disorders such as asthma, diabetes, autoimmune diseases like lupus, diseases like scleroderma, internal colitis, long term disorders like rheumatoid arthritis, severe illnesses like multiple sclerosis and chronic fatigue syndrome and Crohn’s disease. Leaky gut is a name used to describe intestinal or bowel hyperpermeability, which simply means that the tight junction between the cells that line the intestine have opened up sufficiently to allow ‘leakage’ resulting in an altered or damaged bowel lining. Some researchers have also found a relationship with acute and chronic diseases such as systemic inflammatory response syndrome, inflammatory bowel disease, type 1 diabetes, allergies, asthma, and autism. Note too that this syndrome is responsible for many other health conditions too, so if yours is not listed above, please read on. The leaky gut then allows substances such as other toxins, microbes, undigested food, waste, or larger than normal macromolecules to leak through an abnormally permeable gut wall. Proponents suggest that these out-of-place substances affect the body directly or initiate an immune reaction. 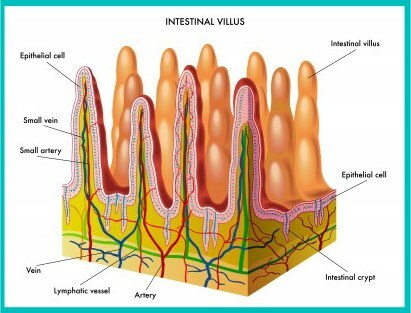 These relatively larger gaps in the intestinal wall cause incompletely digested particles to be partially absorbed. These relatively larger gaps in the intestinal wall cause incompletely digested particles to be partially absorbed. These are targeted by antibodies, forming immune complexes which cause a semi-infectious state and can be carried by the bloodstream to distant sites where they may stimulate the release of cytokines (proteins that serve as messengers between cells. Cytokines regulate various inflammatory responses). are all hypothesized to play a role in the failure to form tolerance, resulting in the autoimmunity that underlies type 1 diabetes. Keep in mind that lifestyle factors, especially what you put in your mouth play a great part in the development and treatment of this condition. Many readers of this blog and material on Next Step*New Life already know that I often cite chronic, out of control inflammation as a baseline cause of many of the diseases we suffer from today — the leaky gut can precipitate this kind of dangerous inflammatory response. Projecting this idea further, it logically follows that you need to pay attention to this because if inflammation is perpetuating or causing your health conditions, you won’t heal until this problem has been resolved. It is very important to follow an anti-inflammatory diet. If you are gluten sensitive you have to avoid wheat, rye and products made with them. So basically you are eating veggies, salads, low to moderate consumption of animal products (eggs, fish, fowl 3- 4 times per week) and small amounts of non-tropical fruit. This condition may take severval months to heal (or more depending on how severe your ‘leaky gut syndrome’ is). Stick with your program. As you progress, the side benefits will be more energy, a lessening of symptoms and possibly losing weight. Thanks for the great info. Wondering if there are any tests that would determine if a person has Leaky Gut. Also would like to know of any cookbooks/recipes solely based on the diet you recommend. Do beans/nuts/grapefruit/lemons/limes fit well in the picture? Hi Dania, There are some lab tests you can get, the Polyethelyne Glycol (PEG) Test which is the most common. It involves taking a solution containing mannitol and lactulose. Mannitol is easily absorbed, penetrating cells, while lactulose has larger molecules and is only partially absorbed. If the levels of mannitol and lactulose in the collected urine sample are high it is indicative of Leaky Gut Syndrome. Low levels of both molecules indicate malabsorption of nutrients. High levels of lactulose and low levels of Mannitol indicate that the person has healthy digestion. There are also stool and candida tests you can ask your doctor for. However, most people who have intestinal bloating, food sensitivities, allergies and some of the other symptoms listed should probably just follow a healthy diet as described for three weeks and see how they feel. For example, if someone is gluten sensitive or has undiagnosed celiac disease they will start to feel better by avoiding gluten-laden products, which can contribute to this syndrome. If this is the case, it might be of benefit to continue this way of eating for a while and take some of the recommended remedies to heal the intestinal area. Thanks again for your great reply. Will start the healthy diet (have been indulging in sweets as of late) and see how it all goes. Truly appreciate you sharing your knowledge.